De är inte kloka de där romarna! Seriesamlarna , catalogue with prices. The publisher was previously known as 'Egmont Serieförlaget', and earlier as 'Hemmets Journals Förlag'. Some books [1,6,7,9] have a new translation for the 'Ny utgava'. Others only have hand lettered text instead of typeset. Thanks to Erik TKS, Christer Lindqvist, and Lars Nyberg. 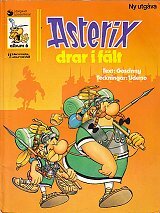 Publisher: Bonniers-Junior Förlag AB, Sweden. The Bonniers edition of  uses a translation that differs from later editions; intro and map texts are the same.